clock to us and we were thrilled when Bill went above and beyond to get it working for us, including the marine time chimes. He is an honnest, sincere individual and we recommend him without reservation. No question - Bill is superb. Wouldn't go anywhere else. Wish I had more clocks needing repair! If you have a clock you have been putting off taking in, you will be in good hands if you bring it to Born Again Clocks. Before you will be informed/shown what he plans to do and given an estimate; and After you will be given a detailed list of what was done and a slide show for confirmation. Listening to my antique clock chiming now - thanks Bill! We thought you would like to know how our Born Again Pendulum Clocks are doing. We placed the Regulator Clock (the smaller of the two) in our office. I “tweaked" the pendulum twice and it has kept perfect time ever since. We plan to build a cabin and decided to wait and hang the Westminster Clock in the cabin when it’s ready. We are currently renting and don’t really have a good place for two pendulum clocks. We are extremely pleased with the work you did on our clocks and the education you gave us. Thank you SO much. I Know that God has a hand in our lives if we are aware and follow the leading of His Holy and I am grateful that we were able to connect with you and your lovely wife. Bill is first rate. Had a great time chatting with Bill about clocks, about woodworking and about life as he installed my father's completely reworked and repaired grandfather clock movement. Truly a good craftsman, an honest tradesman, and worth every penny. Thanks, Bill! After having my cuckoo clock on a temporary mount for about a week ( or two ? ) , I got it to it's home on the wall , it's running right on the tick ! I saw a movie once where they referred to something running like a swiss car . Well , this cuckoo clock is running like a swiss watch ! It is so accurate it's uncanny . I couldn't be happier it's so great . Very good excellent job on your part ! Between your skills , and myself waiting , sometimes stopping to wait on time , it will do it's cuckoo within 5 seconds of the hour ! That is incredible ! Bill did a phenomenal job fixing our precious family heirloom clocks. He explained the process that he would take for cleaning, fixing, and taking care of our clocks. He also was able to give us an estimate regarding the costs that would be incurred. When we came to pick up our clocks he showed us the before and after pictures of his work. This was very interesting. Bill is a very honest and his clock repair and restoration are exceptional. He takes pride in his work and it shows. He also did a wonderful job of explaining what is needed to transport and take care of our antique clocks. Thanks again Bill! My grandfather clock completely stopped recently. I got a referral to Bill by a neighbor who had used him for her clock. Bill set up a convenient time to come by my house to look at my clock. He was extremely professional and clearly explained all my options. He disassembled my clock and made the necessary fixes. He returned as scheduled and I am pleased to report that my GF clock is running beautifully. I highly recommend Bill. Bill is a mechanical wizard! I just brought home our second clock from Born Again Clocks. The first had to have a ratchet made and the second needed a shaft made. No problem for Bill with all his wizardry tools, knowledge, and perseverance. Thanks Bill for saving our family memories. I brought a wall clock in to be refurbished. Bill encouraged me to spend a few dollars more for a new movement (with warranty) rather than to pay his fee for cleaning. Made less for him but better for me! 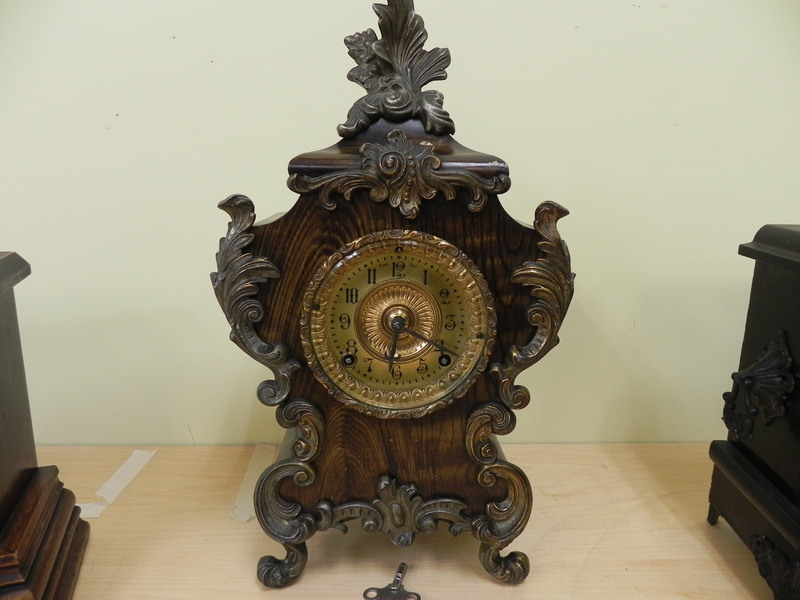 He also located and restored a vintage movement for a family treasure clock that now works as nice as it looks. He does great work. Cleaned and repaired our Japanese made cuckoo clock. It runs so well that it is within seconds or our atomic clock! Excellent to deal with and does great work. It is apparent that Bill Porter loves his work with clocks. He repaired and restored our antique Ansonia open escapement mantle clock beautifully and made us feel a part of the process. He showed and explained its mechanism and taught us about its "care and feeding." It was a pleasure to meet such a high level of courtesy, skill, and professionalism as we did in Bill. And, we should add, it was all done for what we felt was a very reasonable price. If you are looking for a clock repairman, look no farther. You have found your man. We would love to hear what you think of us! Please fill out the form and look for your testimonial above. Thank you for taking the time. Your email is safe with me! I give you my promise!